Fig. 149 Price-elasticity of supply. See entry. 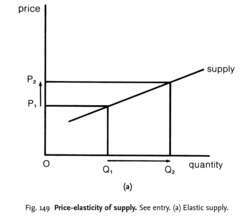 (b) Inelastic supply. Fig. 149 Price-elasticity of supply. See entry. (a) Elastic supply. 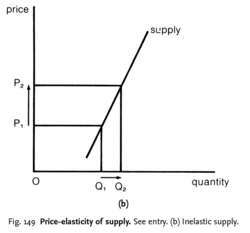 if a change in price produces a less than proportionate change in the quantity supplied, then supply is price-inelastic (Fig%. 147). At the extremes, supply can be perfectly price-inelastic, that is, price changes have no effect at all on quantity supplied, which shows up as a straight-line vertical supply curve; or supply can be perfectly price-elastic, that is, any amount will be supplied at the prevailing price, which shows up as a straight-line horizontal supply curve. The degree of responsiveness of supply to changes in price is affected by the time horizon involved. In the SHORT RUN, supply can be increased only in response to an increase in demand/price by working firms’ existing plant more intensively, but this usually adds only marginally to total market supply. Thus, in the short run, the supply curve tends to be price-inelastic. In the LONG RUN, firms are able to enlarge their supply capacities by building additional plants and by extending existing ones so that supply conditions in the long run tend to be more price-elastic. In some cases, however, for example petrochemicals, the long-run supply responses can be five years or more. Traditional explanations for volatility focus on the low price-elasticity of supply and demand as well as long delays in investment and the backward-looking nature of price expectations. Frankel blamed the boom-bust cycle on the low price-elasticity of supply and demand, which was in turn due to the fundamental characteristics of production and consumption.